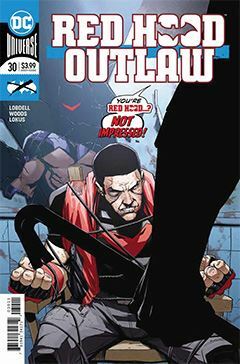 Progress, of a sort, for Red Hood, as he resumes the trail Roy Harper laid out for him before entering rehab at Sanctuary and dying (See Heroes in Crisis #1). The trail leads to an abandoned prison in Mexico, where all manner of strange things happen. One might call it haunted, but that would be inaccurate. For fans of the previous incarnation of this series, we are treated to a guest appearance from Red Hood’s former partners, Artemis and Bizarro. It’s impossible to discern exactly where they are, but they’re there, which means they could be here soon – if that makes any sense. Regretfully, it would help if one has been a long-time readers of Red Hood and assorted other Bat-titles and miniseries. Allusions are made to what has come before, which don’t really deter too much from the story, but I imagine familiarity with some of the references would help. It bothers me to see writers insert something obscure without sufficient exposition. But perhaps that will come in a future chapter. Pete Woods artwork remains consistent, which in this case is not the hobgoblin of little minds. It’s a professional quality that enables the artist to render Gotham, middle America, remote Mexico or a decaying industrial environment with equal ease. Some artists might complain for being able to draw aliens or spaceships, but that’s not the job. The job is draw what the story calls for, and Woods has that firmly under control.